This gemstone has exceptional brilliance and reflection of light, eye catching sparkle in any piece of jewellery. Its bold and unusual colour is perfect for someone who likes something exceptional and exclusive. Spessartine or Mandarin is an orange-yellow variety of Garnet, the name is a derivative of Spessart in Bavaria, Germany, other sources include Australia, Myanmar, India, Afghanistan, Israel, Madagascar, Tanzania and the United States. These gemstones have a remarkably high refraction of light, giving it an exceptional brilliance. Even in unfavorable lighting conditions, well cut Mandarin garnets will sparkle brilliantly. 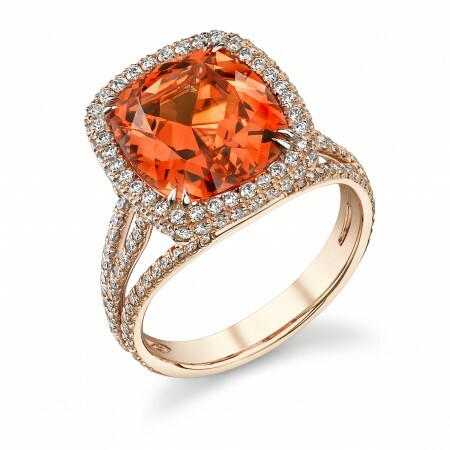 The discovery of brilliant orange spessartite garnet in Namibia in 1991, created a sensation in the jewellery trade. In 1999, a new source was discovered in a remote area of Nigeria. Though the material was more yellow than the orange Namibian crystals, the size and abundance of the material made the public more aware of, and increased the demand for spessartite gems. While spessartites of greater than 100 cts are known from both Brazil and Madagascar, fine gems of more than 15–20 cts are rare. For mandarin garnets from Namibia, fine gems of greater than 5 cts are scarce. Besides its wonderful colours, spessartite garnet has additional advantages which make it a truly unique and valuable gemstone. There is its hardness of 7.5, making it perfect for any piece of jewelry.